Over the past few months quite a few of our number have taken a tumble; slippy pavements, soggy autumn leaves, wonky steps, no street lights, being in a rush – sometime or another, we all lose our step, hopefully with no long lasting ill effects. Some of us can even fall over our bare feet in daylight!! But stumbling doesn’t always have to be a bad thing, least not if we learn from it. And stumbling takes many forms; it can be a physical stumble or it could be making a mistake… According to Brene Brown, an American professor and author and Christian writes that when we stumble – when things don’t go well – we have a tendency to go for fight or flight – its what evolution programmed into us, as a way of coping, but that resilient people don’t do that; they stand still and reflect. They stand still and acknowledge their uncomfortable feelings and often find something useful in them. They certainly can find a more constructive way of dealing with their feelings of embarrassment or failure. One group of people have used this idea to raise awareness of something of huge importance in our Western culture…The idea of standing still and thinking instead of reacting in anger or embarrassment when we stumble has been taken by many Euopean countries and turned into a way of remembering what happened in the Holocaust of WWII. 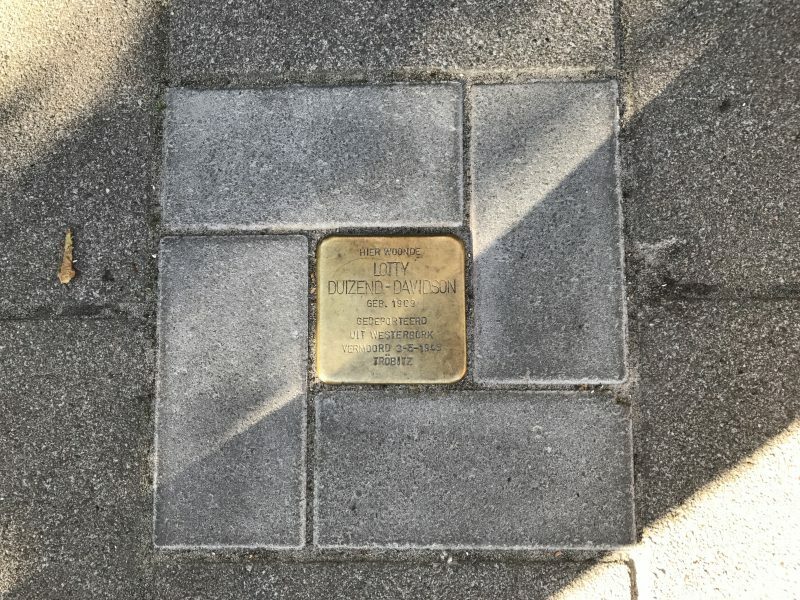 Just around the corner from my friend’s house in Amsterdam there is a stone in the pavement which is a different colour from the rest…it is gold ( well really it is brass), and there is a name and the dates of the life of someone who was a victim of persecution, as well as basic information about where they died. Walking along the pavement the flash of gold causes me to stumble (not literally) and stop to see what it is that is different on the pavement. The illustration on this page is of one of those stones from a street in my friend’s neighbourhood. It remembers Lots Duizend-Davidson who was born in 1909 and deported to Westerbork and murdered on 3rd May 1945. Once I know about one, I start to see them everywhere. And that really does make me stop and think. Yesterday was Holocaust Memorial Day. It’s right that we remember what can happen when we get our priorities and our loyalties out of kilter. First and foremost we are all brothers and sisters – members of the human race, and so should endeavour to look out for one another and treat one another well. Sadly, we don’t always do it and terrible things happen. A stumbling block gives us all a chance to stop and think. We may not have any in Urmston, but the cross of Jesus can have the same effect. It can pull us up short and remember that Jesus died but was raised again. Love is much more powerful than hate or death, and in stopping to think and reflect we all have an opportunity to help it to be that way.